Just a few months ago, former Detroit Mayor Dave Bing was celebrating the new fleet of EMS trucks donated to the city by Roger Penske and other private contributors. Everyone was excited, including the EMS union representative, Joe Barney. "This was the No. 1 game changer right here," he said. However, the Local 4 Defenders have learned months later there are problems, big problems. An insider wants the problems exposed but his identity hidden, fearing for his job. "The trucks are having problems right now. They are mechanically breaking down, and have electrical issues. Airbags on the back suspension are blowing out. Transmissions are going out on them. I mean, sure we're grateful that we got trucks finally, but they're not turning out to be what they were promised to be," he said. Some of the new trucks are ending up in repair shops such as International Trucks on Wyoming in Detroit. At least two of the new EMS rigs are at the shop. Other sources inside the department have sent the Local 4 Defenders photos of other new EMS rigs being worked on instead of being put to use on the streets and responding to calls. Some of the big complaints are about design flaws and claims the trucks were not built to work non-stop like they need to do. "I would guess on average between five and 10 a day," said the insider. That's how many ambulances this insider says are in the shop on any given day. Another concern is the health of the drivers and the patients who are in the new rigs. "The exhaust empties out right next to the door where the patient and the medic is climbing in, and it's also filling the patients department with exhaust fumes," he said. 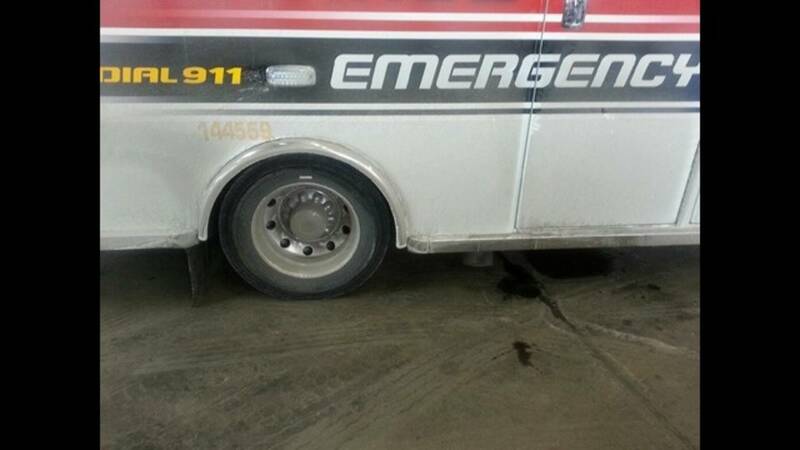 The Defenders contacted the city of Detroit to find out why the problems with the EMS rigs are happening and what will be done to fix the issues. "We are very, very grateful. This generous donation has actually kept EMS alive. Several months ago we were down to five or seven units available per shift and now because of this generous donation we can operate anywhere from 15 to 18 per shift. There have been problems with these vehicles. We acknowledge that. And we have had with the exhaust on these vehicles, not every one, but there has been a handful rigs that have had exhaust problems and we're trying to address that," said Fire Commissioner Jonathan Jackson. Jackson said the trucks are being run non-stop and he admitted that does not leave time for maintenance. "We're in the process of purchasing, identifying new vehicles that can help give these ones a break and we can have regular rotations for service, but also we're trying to hire more people for EMS so we can give our folks a break," he said. New ambulances should be arriving this summer, allowing some of the other rigs to get the needed maintenance.